This is a Dutch recipe from World War I, also known as the Great War. The peoples of all the combatant nations dealt with hunger, food shortage and rationing (see here). The Netherlands did not participate in the war. At the end of it, the German emperor Wilhelm II fled to the Netherlands, where he was granted asylum on the condition that he would not engage in any political activities. He lived at Amerongen Castle until 1920, when he moved to House Doorn near Zeist. He passed away there in 1941 and was buried in a mausoleum on the estate. The emperor was not the first fugitive to cross Dutch borders during the Great War. Between 500.000 and one million Belgians had crossed the Southern Dutch border to flee the war fought on Belgian soil. However, many of the Belgian fugitives returned to their homeland before the end of the war because the reception they received from the Dutch government was cold at best (Wikipedia on Belgian refugees in the Netherlands). 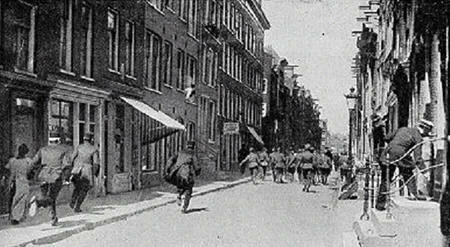 Rationing of food and fuel was introduced in the Netherlands by the government in August 1916. One year later, in the summer of 1917, the people in Amsterdam protested against food shortage, with demonstrations now known as the Potato Riots (see picture). 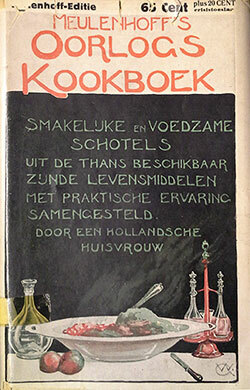 The war was almost over when a new Dutch cookery book appeared in May 1918 with recipes that took the scarcity of fuel and food into account. This was the Oorlogs-kookboek or War-cookbook. The author is not mentioned by name, but is credited as ‘a Dutch housewife’. The introduction is signed with the initials I.K.B. The book sold well, and the second edition appeared a month later. In the introduction of the cookbook the writer promises “tal van smakelijke schotels […] zonder vleesch en zelfs zonder visch, daar visch evenmin steeds verkrijgbaar zal zijn en men toch ook niet elken dag visch kan eten” (All kinds of dishes without meat and even without fish, because fish is also not always available and one can’t eat fish every day anyway). During the Second World War fish would be one of the last kinds of food to be rationed, in July 1944. The introduction of the cookbook continues with a table with cooking times for vegetables and legumes/potatoes etc. in a haybox, including the times on the stove that are needed to bring them to the boil. The macaroni dish from this page needs to cook five minutes on the stove and can then be put in the haybox for two hours. There is also a list of condiments to keep in stock “al naar de financiën het toelaten” (so long as one’s finances allow): soy sauce, mustard, tarragon vinegar, curry powder, stock cubes, Maggi Sauce, dried bread-crumbs, a mixture of ‘cook’s spices’, white pepper, citric acid and lemon oil. Oil for salad dressing can be substitued with buttermilk or sour cream. The Maggi Sauce and stock cubes will add flavour to meatless dishes. 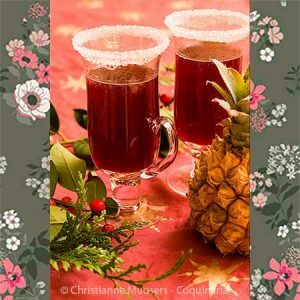 There are also recipes for making coffee-extract with very little coffee, and for making tea with dried leaves of bramble- or strawberry bushes. There are sixty recipes in the cookbook, presented in twenty menus. The recipe from this page is in the second menu that is rather rich in carbohydrates; the macaroni dish is the first course, which is followed by baked patties of mashed potatoes with fried eggs and lettuce, and rice pudding as dessert. In all, the War-Cookbook only contains two recipes with meat, one for rabbit stew (menu 10, p.49) and one for ‘rookvlees’ (cured and smoked but not cooked beef or horse meat, menu 15, p.63). When I first read this recipe, I was shocked at how long the pasta needs to be cooked. No less than a half hour! Today we consider overdone pasta to be an abomination, and it must be cooked ‘al dente’. So my first thought was: “I won’t be doing that, cooking my pasta for so long”. But then I decided to follow the recipe to the letter before judging. To my surprise, the macaroni had not turned into a blubber. The pasta had absorbed more water than they would have if they had been cooked the prescribed ten to twelve minutes, but it was still good to eat. I can even imagine that because of the extra volume the pasta was more filling; a good thing during food scarcity. The morale of this story is: do not always think that a recipe from the past is wrong, just because we are used to other ways of preparation. 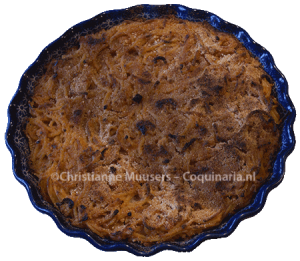 This recipe for macaroni with tomatoes is from the Oorlogs-kookboek (War-cookbook), the second menu, on p.24/25. Een half pond tomaten of 4 eetlepels tomatenpurée, 1 bouillonblokje in een theekopje water opgelost, 3 eetlepel geraspte kaas, 1 uitje, een stuk boter ter grootte van een ei, een halve beschuit en zoo mogelijk 2 theelepels Maggi’s aroma. De macaroni in kleine stukken breken, wasschen en gaar koken in ruim water met een halve eetlepel zout, ongeveer een half uur. Af en toe roeren om te voorkomen dat ze zich aan den bodem der pan vastzet. Daarna ze op een vergiet laten uitlekken. De bouillon met het fijn gesnipperde uitje in een pan op het vuur zetten. Is dit goed warm, dan de tomatenpurée, de kaas en de maggi’s aroma toevoegen, en het laatst de macaroni er goed doorroeren. Doe alles goed warm in een met boter ingewreven vuurvasten schotel, strooi er fijne beschuit over, verdeel de boter in kleine stukjes er op en zet den schotel een half uur in den oven. Heeft men geen oven dan zet men den schotel met een deksel er op, op een zacht vuur te stoven. A half pound tomatoes or 4 tablespoons tomato purée, 1 stock cube dissolved in a teacup water, 3 tablespoons grated cheese, 1 small onion, piece of butter the size of an egg, a half rusk, and if possible 2 teaspoons Maggi Aroma. Break the macaroni into small pieces, wash them, and boil them in ample water with a half tablespoon salt, about a half hour. Stir occasionally to prevent them sticking to the bottom of the pan. Then let them drain. Put the stock with the finely chopped onion on the fire. When it is hot, add the tomato purée, the cheese and Maggi Aroma, and lastly stir in the macaroni. Put everything still hot in an ovenproof dish, greased with butter, sprinkle crushed rusk over it, arrange small pieces of butter on it and put the dish in the oven for a half hour. 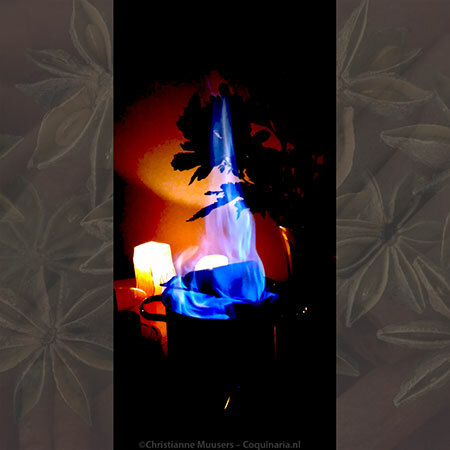 If one does not have an oven than simmer the dish with a lid on it, on a low fire. The list of ingredients in the original recipe mentions ‘a half pound tomatoes or 4 tablespoons tomato purée’. But in the recipe only purée is mentioned, so that is what I used for the adaptation. If cooking the pasta for half an hour seems too adventurous, just prepare the pasta according to the instructions on the package. First course for 5 to 6 persons, main course for 3 persons; preparation in advance 35 minutes; preparation 35 minutes. Break the bucatini in smaller pieces and boil these for a half hour in ample water. Drain. Chop the onion, put it in a pan with the half stock cube, one tablespoon butter and 2.5 decilter (1 cup) water. Bring to the boil. Add tomato purée and Maggi, stir until the purée has dissolved. Take the pan from the stove. Add bucatini and cheese, and put everything in a greased oven dish. Up until this step the dish can be prepared in advance. Preheat the oven to 180 °C/355 °F. Cover the bucatini with dried bread crumbs or rusk, and divide the remaining butter over it. Put the dish a little above center in the oven, and bake for a half hour until the top has a lovely brown colour. Put the hot oven dish on the table on a heat-proof coaster. Serve with green salad and extra cheese. Using a low, wide pie mould, will result in relatively more crunchy crust. Long, hollow pasta, thicker than spaghetti. See more on long and short pasta on the page History of pasta. It is not a lot a work, grating cheese. Moreover, there will be no unwanted additives like cornstarch to prevent the grated cheese from clotting together, and it saves money. In 1886, the Swiss Julius Maggi delevoped a soy sauce-like herbal seasoning based on bean and wheat meal, to compete with the meat extract of Liebifg. The taste is much like that of lovage (Levisticum officinale). In Dutch lovage is now even called maggikruid (Maggi herb). But lovage is not listed as an ingredient of the seasoning. For more information on the history of Maggi, please visit the German wikipedia the subjects Maggi and Maggi-Würze. In this article in the Chicago-Tribune, author Kevin Pang mentions that Maggi seasoning exists in many varieties for specific regions. Oorlogs-kookboek. […] Met practische ervaring samengesteld door een hollandsche huisvrouw. (‘War cookbook’) Meulenhoff, Amsterdam, 1918. Online version. Wikipedia on the Netherlands in World War 1.